Shut the Door and Teach: Disruptive Thinking Part 2: Is BHH the New QAR? Disruptive Thinking Part 2: Is BHH the New QAR? 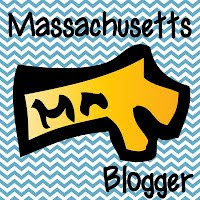 In my last post I began a discussion of Part 1 of Disruptive Thinking with a contest. Christie, you won a copy of the book! Also in my previous post I also talked about the struggle reading poses to students and teachers, but how that process is sort of the point, as opposed to rote answers. 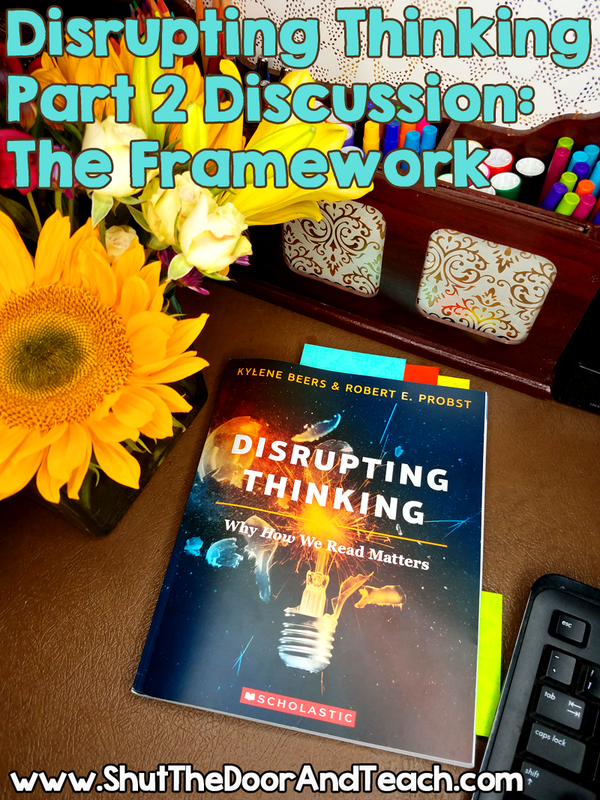 Part 2 of Disrupting Thinking gets into the meat of the instruction: How do you talk to your students about the thought disrupting process of reading? How do you get them to think about and also respond to what they are reading in a deeper way? 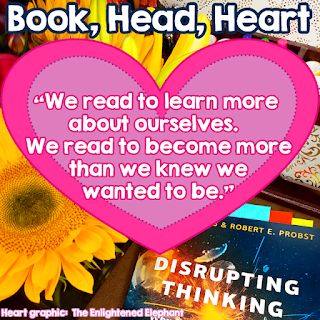 The "hook" the authors describe in this book is the "Book, Head, Heart Framework" (BHH). They focus most on the heart in this section; the reason being is that many other texts, including ones they've written in the past, cover the "In the Book" part, aka, text dependent, one right answer kind of questions. The "head" questions are more inferential and more metacognitive. Students think about the confirmation and/or changes in their expectations and assumptions. Readers with different background will have different ideas here, and this is where comprehension can really start to break down or evolve. Personally this was not a new concept for me, but these are the types of questions that I'm always trying to include more of in my teaching because they go deeper and it's how instruction is differentiated. Really, the "In Your Heart" questions are the deepest of questions: these are the questions that are a call to action. They get into the real reason for reading beyond taking a test: How does this book resonate with or change who you are? Not every book will do that, but one of my takeaways is that it's part of my job to pick books that provide opportunities for creating positive changes in my students' mindsets. Again, the authors ask us to practice what they preach, and give us a poem to reflect on with the framework to practice on. But I feel a greater need to share how I used the framework on this book. For the "In my head" response, I couldn't help thinking of a framework of questions I used about 15 years ago, back when I taught 3rd grade. I kept thinking "In My Head, In the Text, In the World." A quick Google search brought me here: http://schochsite.pbworks.com/f/au_hirata_raphael_article.pdf to an article on Question Answer Relationship (QAR). Using this method, I helped students analyze the types of questions that were on practice MCAS questions. When there weren't enough deep questions, I made my own. QAR is more about analyzing prepared questions. The key word is questions, as opposed to text or the reader. BHH is more about student generated questions about a text. There are sentence starters to help students formulate questions (great for ELLs and other students who need the scaffold). But the students lead the generation of questions. The focus is actually more on the reader than on the questions. And the reader and text matter in equal proportion in BHH, I would say. There are questions, only as a vehicle for eliciting a response. QAR's third question type is "In the World." BHH's third question type is "In my Heart." I believe that the two are in practicality the same, but philosophically different. Again, I hope the authors weigh in here. But to me, QAR is more about observing how the book relates to the real world. Connections are made to current events. BHH is also about making a connection to the real world, but it's more of a call to action than an observation. It's taking something to heart. It's about changing or reaffirming the reader's feelings and attitudes and reshaping them so that when they go out into the world, they will act more responsibly. 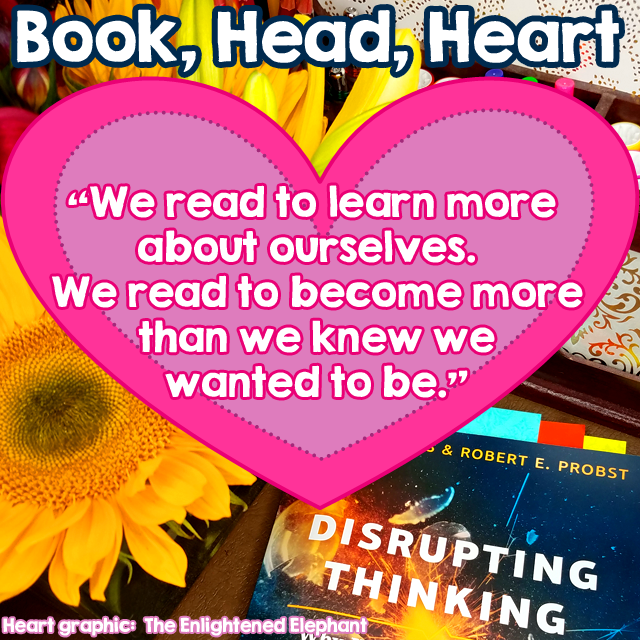 So when I first read Part 2, I thought "I need to make some Head and Heart Questions for specific books." But the more I thought about it, the more I thought, "Is this sort of defeating the point? The questions need to be student generated." The anchor charts are right there: "In the book, what's it about, who's telling the story, what does the author want me to know?" "In your head, what surprised you, what changed?" "In your heart, what did you take to heart? What did you learn about yourself? "What do you need to help change?" If we get more specific than that, are we leading students to "right answers?" For example, I read BFG by Roald Dahl with my students. [Spoiler Alert] One of the "In My Heart" reactions I had, when I read the book, was that Sophie learns that just because the giant doesn't speak "properly," he is very intelligent and has other gifts to share. This not only makes Sophie more compassionate and connected to the world outside her orphanage, but it awakens Sophie's confidence in herself. 1. Read chapter 5. What does the author want you to know? What surprised you? What did you learn about you? 2. Read paragraph 5 on page 100. 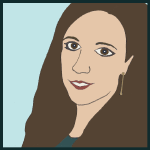 What does the author want you to know about Sophie? What did you learn about you? What surprised you about the BFG over the course of the book so far? 3. Read paragraph 5 on page 100. What does the author want you to know about Sophie's attitude toward the BFG? How did her assumptions about the BFG's intelligence change? If you meet someone who speaks differently from you, what should/shouldn't you assume about them?" I suppose the answer is, #1 is the goal. We want students to make their own connections. If they are not there yet, provide as much scaffolding as necessary with the goal of removing scaffolds as they mature as readers. Let's face it, in #3, we're wading (/plunging?) right into "One right answer territory." And that alone will not produce truly responsive readers. We need students to integrate new material into their own schema and sense of self, be open to growth and change, and ask their own questions. I'm eager to see if Part 3 addresses any of my questions. In the meantime, what are your thoughts on the BHH framework for responses? Was your first thought to go write text specific questions or start copying one of their anchor charts? Can you think of different instances where each approach would apply?